Equality between women and men is one of the millennium goals. However, policies adopted to pursue such a goal mainly rely on an essentialized “Woman” subject. This chapter discusses the detrimental practical implications of such conceptualizations as a source of global inequality within the current bordered configuration of the planet in the age of migrations. The chapter is articulated along four sections. The first section recalls the relevance of the gendered care structure as an essential category for theories of justice. The second section discusses the concept of group-based gender vulnerability and its limits. The third section engages with the contributions of counterhegemonic feminisms and proposes intersectionality as a key concept to reveal the gendered, racialized and bordered dimensions of social injustices at the global level. The fourth section analyzes a case study. Aiming at bridging theory and praxis, Spanish gender equality policy are analyzed to illustrate the practical implications of the conceptualizations discussed in the previous sections. The chapter shows that Spanish equality policies are exclusionary and reproduce vulnerability for exploited migrant women working in the care sector. Intersectionality is indicated as an indispensable category to make equality policies inclusive and advance towards gender justice at the global level. This work has been supported by the R&D grant “Human rights and global justice in the context of international migrations” (FFI2013-42521-P) funded by the Spanish Program for the Promotion of Scientific and Technical Research for Excellence. 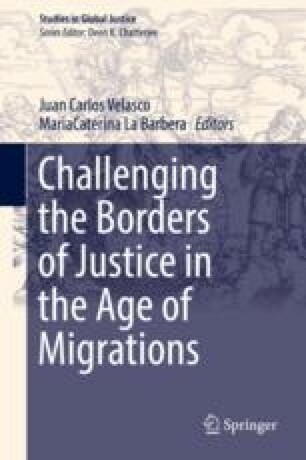 I am grateful to friends and colleagues for their careful reading and constructive suggestions to previous versions of this chapter, in particular to Juan Carlos Velasco, Isabel Turégano, Francisco Blanco Brotons and Jone Martínez Palacios. CMW, Committee on Migrant Workers. General Comment No 1 on Migrant Domestic Workers (UN Doc. CMW/C/GC/1, 23 February 2011). http://tbinternet.ohchr.org/_layouts/treatybodyexternal/Download.aspx?symbolno=CMW%2fC%2fGC%2f1&Lang=en. Last accessed Mar 2018. ECRI. 2011. Fourth report on Spain. Directorate General of Human Rights and Legal Affairs: Strasbourg. http://www.coe.int/t/dghl/monitoring/ecri/country-by-country/spain/ESPCBC-IV-2011-004-ENG.pdf. European Institute for Gender Equality (EIGE). 2017. Gender equality index. http://eige.europa.eu/gender-equality-index. European Union Agency for Fundamental Rights, FRA. 2014. Violence against women. http://fra.europa.eu/en/publication/2014/violence-against-women-eu-wide-survey-main-results-report. Finotelli, Claudia, and Irene Ponzo. 2017. Integration in Times of Economic Decline. Journal of Ethnic and Migration Studies. https://doi.org/10.1080/1369183X.2017.1345830. Finotelli, C., M.C. La Barbera, and G. Echevarría. 2017. Beyond Instrumental Citizenship. Journal of Ethnic and Migration Studies. https://doi.org/10.1080/1369183X.2017.1345838. ILO, International Labour Organization. 2016. Migrant Domestic Workers. Geneva: International Labour Office, http://www.ilo.org/wcmsp5/groups/public/%2D%2D-ed_protect/%2D%2D-protrav/%2D%2D-migrant/documents/briefingnote/wcms_467720.pdf. Last accessed in Mar 2018. INE, Instituto Nacional de Estadística/National Statistical Institute. 2010. Encuesta del tiempo, http://www.ine.es/prensa/eet_prensa.htm. ———. 2017b. Ban Without Prosecution, Conviction Without Punishment, and Circumcision Without Cutting: A Critical Appraisal of Anti-FGM Laws in Europe. Global Jurist 17 (2). https://doi.org/10.1515/gj-2016-0012. La Barbera, MariaCaterina, and Emanuela Lombardo. 2017. “The Long and Winding Road”: A Comparative Policy Analysis of Multilevel Judicial Implementation of Work–Life Balance in Spain. Journal of Comparative Policy Analysis. https://doi.org/10.1080/13876988.2017.1363949. Laulom, S., et al. 2012. How has the crisis affected social legislation in Europe? ETUI Policy Brief. https://www.etui.org/fr/content/download/5195/51682/file/Policy+Brief+2-2012+EN.pdf. UN Women. 2016. Infographic: Migrant domestic workers. http://www.unwomen.org/en/digital-library/multimedia/2016/9/infographic-migrant-domestic-workers.